Not to be confused with Bronchiolitis obliterans organizing pneumonia. Bronchiolitis obliterans (BO) is a disease that results in obstruction of the smallest airways of the lungs (bronchioles) due to inflammation. Symptoms include a dry cough, shortness of breath, wheezing, and feeling tired. These symptoms generally get worse over weeks to months. It is not related to organizing pneumonia. Causes include breathing in toxic fumes, respiratory infections, connective tissue disorder, or following a bone marrow or heart-lung transplant. Symptoms may not occur until two to eight weeks following toxic exposure or infection. The underlying mechanism involves inflammation that results in scar tissue formation. Diagnosis is by CT scan, pulmonary function tests, or lung biopsy. A chest X-ray is often normal. While the disease is not reversible treatments can slow further worsening. This may include the use of corticosteroids or immunosuppressive medication. A lung transplant maybe tried. Outcomes are often poor with most people dying in months to years. Bronchiolitis obliterans is rare in the general population. It affects about 75% of people by ten years following a lung transplant and up to 10% of people who have received a bone marrow transplant from someone else. The condition was first clearly described in 1981. Prior descriptions occurred as early as 1956. Bronchiolitis obliterans is a lung disease characterized by fixed airway obstruction. Inflammation and scarring occur in the airways of the lung, resulting in severe shortness of breath and dry cough. FEV1 (forced expiratory volume in 1 second) should be above 80% of predicted values to be considered normal. Bronchiolitis obliterans reduces this to between 16% and 21%. Symptoms include: dry cough, shortness of breath and wheezing. The symptoms can start gradually, or severe symptoms can occur suddenly. Bronchiolitis obliterans has many possible causes, including: collagen vascular disease, transplant rejection in organ transplant patients, viral infection (respiratory syncytial virus, adenovirus, HIV, cytomegalovirus), Stevens-Johnson Syndrome, Pneumocystis pneumonia, drug reaction, aspiration and complications of prematurity (bronchopulmonary dysplasia), and exposure to toxic fumes, including: diacetyl, sulfur dioxide, nitrogen dioxide, ammonia, chlorine, thionyl chloride, methyl isocyanate, hydrogen fluoride, hydrogen bromide, hydrogen chloride, hydrogen sulfide, phosgene, polyamide-amine dyes, mustard gas and ozone. It can also be present in patients with rheumatoid arthritis. Certain orally administrated emergency medications, such as activated charcoal, have been known to cause it when aspirated. Additionally, the disorder may be idiopathic (without known cause). There are many industrial inhalants that are known to cause various types of bronchiolitis, including bronchiolitis obliterans. Bronchiolitis obliterans may be caused by inhalation of airborne diacetyl, a chemical used to produce the artificial butter flavoring in many foods such as candy and microwave popcorn and occurring naturally in wines. This first came to public attention when eight former employees of the Gilster-Mary Lee popcorn plant in Jasper, Missouri, developed bronchiolitis obliterans. In 2000, the Missouri Department of Health called in the National Institute for Occupational Safety and Health to make a determination of the cause, and to recommend safety measures. After surveying the plant and each patient's medical history, NIOSH recommended respiratory protection for all workers in microwave popcorn production. Due to this event, bronchiolitis obliterans began to be referred to in the popular media as "popcorn Lung" or "popcorn workers lung". It is also referred to as "flavorings-related lung disease". Bronchiolitis obliterans caused by diacetyl inhalation begins with a cough, wheezing and dyspnea (shortness of breath), and usually progresses slowly, but severe symptoms can develop without warning. Other symptoms that appear in some workers include fever, weight loss, and night sweats. Symptoms do not change when workers are away from the workplace. CT images show bronchial wall thickening and trapped air. Non-smokers may be at higher risk for this form of bronchiolitis obliterans. The Occupational Safety and Health Administration (OSHA) recommended that diacetyl manufacturing companies regularly sample air in work environments, provide air purifying respirators, and engage in medical surveillance of at-risk workers. In 2011, National Institute for Occupational Safety and Health proposed a recommended short-term exposure limit of 25 parts per billion (ppb) and a time weighted average exposure of 5 ppb. In 2007 a heavy consumer of microwaved popcorn was diagnosed by a doctor in Denver with "popcorn lung," the first known case involving a consumer. On 16 January 2008, it was announced that Wayne Watson, a Denver man who developed "popcorn lung" after inhaling fumes from microwaved popcorn, was suing the Kroger grocery store chain and its affiliates. In the lawsuit, filed in U.S. District Court, Watson's attorney claimed that the companies "failed to warn that preparing microwave popcorn in a microwave oven as intended and smelling the buttery aroma could expose the consumer to an inhalation hazard and a risk of lung injury." On September 19, 2012 a jury in U.S. District Court in Denver awarded $2.3 million in actual damages and $5 million in punitive damages to Watson. Defendants included Glister-Mary Lee, the manufacturer; Kroger, and Kroger's subsidiary Dillons, owners of King Soopers & City Market, a Colorado regional supermarket chain. On 27 August 2007, Weaver Popcorn Company of Indianapolis promised to replace the diacetyl butter flavor ingredient in Pop Weaver popcorn with another flavoring. In September 2007, Dr. Cecile Rose, pulmonary specialist at Denver's National Jewish Health medical and research Center, warned federal agencies that consumers, not just flavoring or food factory workers, may be in danger of contracting bronchiolitis obliterans. David Michaels, of the George Washington University School of Public Health, first published Rose's warning letter on his blog. On 4 September 2007, the Flavor and Extract Manufacturers recommended reduction of diacetyl in butter-like flavorings. The next day ConAgra Foods announced that it would soon remove diacetyl from its popcorn products. Diacetyl is approved by the Food and Drug Administration as a safe flavor ingredient, but there is evidence to suggest that inhalation in large amounts is dangerous. There are currently no warnings from federal regulators about diacetyl. 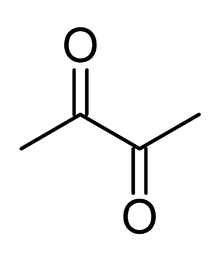 A NIOSH peer-reviewed publication documents that, in laboratory studies, acute inhalation exposures to acetyl propionyl(2,3-pentanedione), one of the compounds with a buttery flavor and/or smell put forward as a safer alternative to diacetyl, cause airway epithelial damage that is as harmful as diacetyl. A new form of constrictive bronchiolitis is starting to present in Iraq and Afghanistan veterans. It has been attributed to veterans being exposed to trash burn pits. Veterans present with shortness of breath and other asthma like symptoms. The only way to diagnose this condition is by doing a lung biopsy as chest x-rays and CT scans come back as normal. The government still denies that there is any correlation between burn pits and health problems but the government has started an "Airborne Hazards and Open Burn Pit Registry" to begin tracking the health of veterans who were exposed to burn pits to see if there is a connection. Bronchiolitis obliterans is often misdiagnosed as asthma, chronic bronchitis, emphysema or pneumonia. Several tests are often needed to correctly diagnose bronchiolitis obliterans, including chest x-rays, diffusing capacity of the lung tests (DLCO), spirometry, lung volume tests, high-resolution CT (HRCT), and lung biopsy. Diffusing capacity of the lung (DLCO) tests are usually normal; people with early-stage BO are more likely to have normal DLCO. Spirometry tests usually show fixed airway obstructions and sometimes restriction, where the lungs can't expand fully. Lung volume tests may show hyperinflation (excessive air in lungs caused by air trapping). 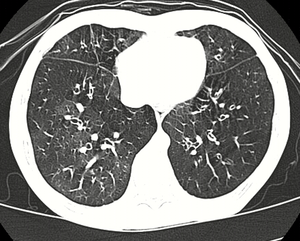 HRCT can also show air trapping when the person being scanned breathes out completely; it can also show thickening in the airway and haziness in the lungs. Transthoracic lung biopsies are preferable for diagnosis of constrictive BO compared to transbronchial biopsies; regardless of the type of biopsy, a diagnosis may only be achieved by examination of multiple samples. Flavorings-related lung disease can be prevented with the use of engineering controls (e.g. exhaust hoods or closed systems), personal protective equipment, monitoring of potentially affected workers, worker education, and by not using lung-disease-causing flavorings. This disease is irreversible and severe cases often require a lung transplant. Transplant recipients are at risk for re-developing the disease, as bronchiolitis obliterans is a common complication of chronic rejection. Evaluation of interventions to prevent bronchiolitis obliterans relies on early detection of abnormal spirometry results or unusual decreases in repeated measurements. A multi-center study has shown the combination of inhaled fluticasone propionate, oral montelukast, and oral azithromycin may be able to stabilize the disease and slow disease progression. This has only been studied in patients who previously underwent hematopoietic stem cell transplantation. 1 2 3 4 5 "Bronchiolitis obliterans". GARD. 2012. Retrieved 13 September 2016. ↑ Schlesinger, C.; Meyer, C.; Veeraraghavan, S.; Koss, M. (Jan 1998). "Constrictive (obliterative) bronchiolitis: diagnosis, etiology, and a critical review of the literature". Annals of Diagnostic Pathology. 2 (5): 321–334. doi:10.1016/S1092-9134(98)80026-9. PMID 9845757. ↑ Xie, BQ; Wang, W; Zhang, WQ; Guo, XH; Yang, MF; Wang, L; He, ZX; Tian, YQ (2014). "Ventilation/perfusion scintigraphy in children with post-infectious bronchiolitis obliterans: a pilot study.". PloS one. 9 (5): e98381. PMID 24852165. 1 2 3 4 Lynch JP, 3rd; Weigt, SS; DerHovanessian, A; Fishbein, MC; Gutierrez, A; Belperio, JA (October 2012). "Obliterative (constrictive) bronchiolitis.". Seminars in respiratory and critical care medicine. 33 (5): 509–32. PMID 23001805. ↑ Gourtsoyiannis, Nicholas C.; Ros, Pablo R. (2005). Radiologic-Pathologic Correlations from Head to Toe: Understanding the Manifestations of Disease. Springer Science & Business Media. p. 154. ISBN 9783540266648. 1 2 Centers for Disease Control and Prevention (2002). Fixed obstructive lung disease in workers at a microwave popcorn factory (7th ed.). ↑ Sam, Amir H.; James T.H. Teo (2010). Rapid Medicine. Wiley-Blackwell. ISBN 1-4051-8323-3. ↑ "Activated charcoal bronchial aspiration". Retrieved 2016-01-23. ↑ Brant & Helms (1999). Fundamentals of Diagnostic Radiology. Baltimore: Williams & Wilkins. ISBN 0-683-30093-8. ↑ Webb; et al. (2000). High Resolution CT of the Lung (3rd ed.). Philadelphia: Lippincott Williams & Wilkins. ISBN 0-7817-0217-8. 1 2 3 4 Brown, Jay A. "Haz-Map; Information on Hazardous Chemicals and Occupational Diseases". National Institutes of Health. ↑ Colby, T.V. (1998). "Bronchiolitis, Pathologic Considerations". Am J Clin Pathology (109): 101–9. ↑ Harber P, Saechao K, Boomus C (2006). "Diacetyl-induced lung disease". Toxicol Rev. 25 (4): 261–272. doi:10.2165/00139709-200625040-00006. PMID 17288497. ↑ "Preventing lung disease in workers who make or use flavorings". National Institute for Occupational Safety and Health. 2004. ↑ Schachter, E. Neil (2002). "Popcorn Workers' Lung". New England Journal of Medicine. 347 (5): 360–1. doi:10.1056/nejme020064. ↑ Egilman, David (2007). "Popcorn Workers Lung" (PDF). 1 2 Sauler, Maor; Gulati, Mridu (December 2012). "Newly Recognized Occupational and Environmental Causes of Chronic Terminal Airways and Parenchymal Lung Disease". Clinics in Chest Medicine. 33 (4): 667–680. doi:10.1016/j.ccm.2012.09.002. PMC 3515663 . PMID 23153608. 1 2 3 4 5 "CDC - Flavorings-Related Lung Disease - NIOSH Workplace Safety and Health Topic". www.cdc.gov. Retrieved 2015-10-15. ↑ Reuters New Report: FDA to probe popcorn link in man's lung disease. ↑ Man sues for "popcorn lung" by George Merritt, Associated Press Online edition, accessed Apr 29 2011. ↑ Mark Jaffe (September 21, 2012). "Centennial man with "popcorn lung" disease gets $7.3 million award". The Denver Post. Archived from the original on September 22, 2012. Retrieved September 22, 2012. ↑ "Europe takes 'wait-and-see' stance on diacetyl flavouring". FoodNavigator.com. Retrieved 18 December 2015. ↑ "News Feed Researcher". Retrieved 18 December 2015. ↑ "CDC - Flavorings-Related Lung Disease: Exposures to Flavoring Chemicals - NIOSH Workplace Safety and Health Topic". Retrieved 18 December 2015. ↑ Harrison Jacobs (5 November 2013). "Open-Air Burn Pits Leave Troops Sickly - Business Insider". Business Insider. Retrieved 18 December 2015. ↑ "CDC - Flavorings-Related Lung Disease: Exposure Control - NIOSH Workplace Safety and Health Topic". www.cdc.gov. Retrieved 2015-10-22. ↑ "Paper: Encouraging Results of a Phase II Trial of Inhaled Fluticasone Propionate, Azithromycin, and Montelukast (FAM) May Maintain Lung Function in Bronchiolitis Obliterans Syndrome (BOS) after Hematopoietic Cell Transplantation". Retrieved 18 December 2015. King MS, Eisenberg R, Newman JH, et al. (July 2011). "Constrictive bronchiolitis in soldiers returning from Iraq and Afghanistan". N. Engl. J. Med. 365 (3): 222–30. doi:10.1056/NEJMoa1101388. PMC 3296566 . PMID 21774710. Brown JA. "Bronchiolitis obliterans". Haz-Map Information on Hazardous Chemicals and Occupational Diseases. National Institutes of Health. "(NIOSH) Alert: Preventing lung disease in workers who make or use flavorings". National Institute for Occupational Safety and Health. 2004. "Flavorings-Related Lung Disease". National Institute for Occupational Safety and Health.